Ahmed worked for Carnegie Hall's Education Department and the Brooklyn Philharmonic as a performing and teaching artist for a number of years. He is currently a Teaching Fellow with the Department of Education, teaching music in Bedford Stuyvesant, Brooklyn at PS 3. He has a Masters degree in education and is also an adjunct professor at The New School, a university in Manhattan, where he teaches a course on the music and philosophy of Sun Ra. He has written a yet- to-be published memoir of his experience in the music entitled, A Strange Celestial Road (Traveling the Spaceways). He leads the group Diaspora (Dispersions of the Spirit of Ra), which combines poetry and lyrics with a large instrumental group as well as the group Ebonic Tones. He is a founding member of the collective quartet, NAM. He formed Melchizedek Music Productions in 1995 with his wife, Monique Ngozi Nri. Together, they have produced concerts locally and abroad. In 1998, Abdullah was offered the position of Music Director of Sistas' Place, a Bedford Stuyvesant coffee house. Since then, he has introduced many of the adventurous musicians of the Seventies' Loft Movement to this venue with great success. His vision has allowed for the expansion of its Saturday Night Jazz programming, from a bi-monthly to a weekly format initiating several new forums along the way. After several years of producing concerts at Sistas' Place, Melchizedek Music Productions came up with the idea of calling the music Jazz: A Music of the Spirit. Ahmed Abdullah also became a founding member of the Central Brooklyn Jazz Consortium (CBJC), an umbrella group of venues and organizations that produces Jazz Festivals and other events in Brooklyn. He received a Jazz Impact Award from the CBJC in April 2009. Sistas' Place, as of June 30, 2009, is moving to a new location at the corner of Nostrand and Jefferson avenues. The final concert, an all-star event, at the old location was organized by Melchizedek Music Productions in association with the December 12th Movement on Saturday, June 27th. 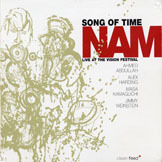 The artists who performed included Rene McLean, Craig Harris, Alex Harding, Alan Jay Palmer, Alex Blake, Andrew Cyrille and Neil Clarke in one band and James Spaulding, Cecil Bridgewater, Onaje Allan Gumbs, Reggie Workman and Rudy Walker in the second ensemble to create one historic night of music. Abdullah's CD releases, NAM Live at the Vision Festival on Clean Feed Records, Dispersions of the Spirit of Ra, Traveling the Spaceways on Planet Arts Recordings and Ebonic Tones Tara's Song on Tum Records, can be purchased from this website. All About Jazz musician pages are maintained by musicians, publicists and trusted members like you. Interested? Tell us why you would like to improve the Ahmed Abdullah musician page.